This is a prime example of Alfred Gilbert’s experimental working methods. The central core is a discarded bronze torso from another statuette. 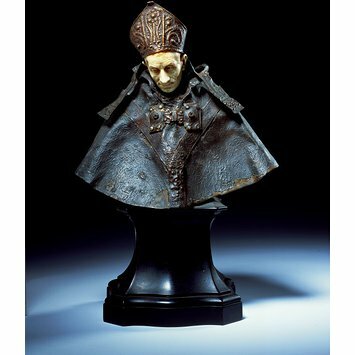 To this he has added a painted ivory head, a bronze cope studded with glass beads and a copper mitre. Though meant as a model for a tomb figure, it was sold as an independent work. It is a model for the tomb of Prince Albert Victor, Duke of Clarence, at Windsor. The tomb was commissioned from Gilbert in 1892, and this bust would have been one of the group of statuettes placed around the effigy. However in the event Gilbert did not include it and sold it separately in 1899. Sir Alfred Gilbert (1854-1934) was a famous British sculptor of the late 19th century. He was also medallist, goldsmith and draughtsman. He was known for his inventiveness and characteristically used many different materials in the same work. He epitomised the movement known as the “New Sculpture”, with a new focus on naturalistic forms. His many commissions included for example the celebrated figure of Eros, part of the Shaftsbury memorial. This was made in a novel material, aluminium. Gilbert's masterpiece was however the tomb for the Prince and Princess of Wales's eldest son, the Duke of Clarence, in the Albert Memorial Chapel at Windsor Castle, commissioned in 1892. He became obsessed with this commission and it took him 36 years to finish, causing him financial difficulties, which resulted in his selling copies of individual figures of the saints from the monument. 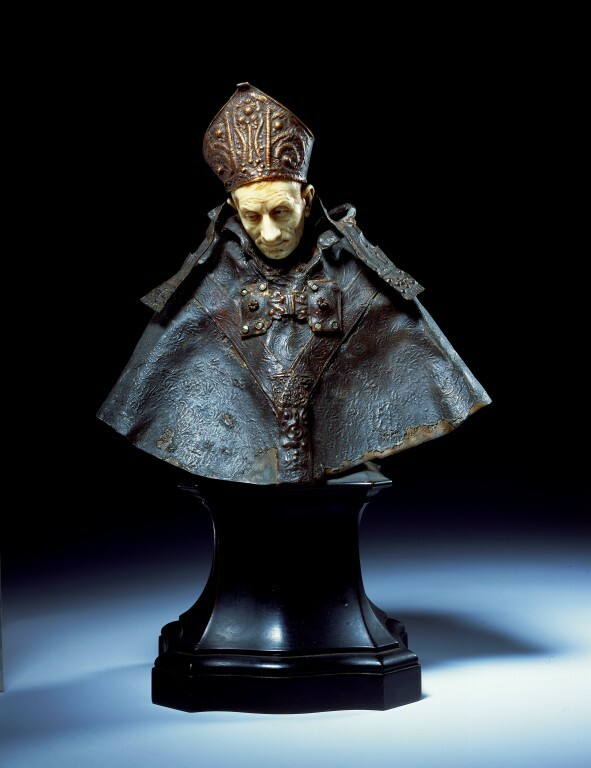 The aged bishop, wearing a mitre and cope looks downwards. 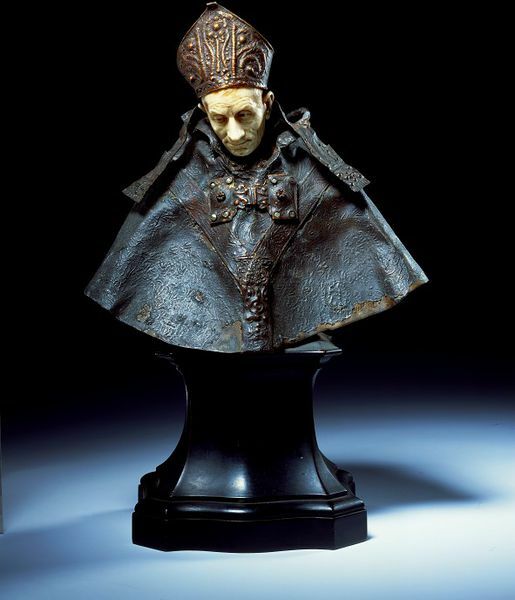 His head is carved in ivory and his robes made of copper foil and lead foil with wax. The bust is set on an ebonised wood socle. The bust, made by Alfred Gilbert (1854-1934) was conceived as part of the Tomb of the Duke of Clarence (1892-1901) for the Albert Memorial Chapel, Windsor, commissioned in 1892. The combination of materials connects it with the first group of statuettes from the tomb. At one time mistakenly identified as Edward the Confessor, the work was more recently catalogued as A Bishop Saint by Richard Dorment. Gilbert apparently decided not to include the bust in the tomb and he sold it to Robert Dunthorne for £70 in 1899. Dunthorne immediately sold it to William Vivian, a collector that had already acquired several copies of statuettes from the tomb. The bust was passed through the family before being given to the museum by Lord Harvey of Tasburgh. The bust was given to the museum in 1995 by Lady Harvey of Tasburgh, in accordance with the wishes of Lady Jean Makins MBE. The bust and two other works in the collection relate to Gilbert's commission for the Tomb of the Duke of Clarence. Attribution note: The bust reveals Gilbert's spontaneous and experimental techniques. The bust, constructed out of the torso of the St. George figure used for the Clarence tomb, with the cope, ivory head and mitre added on, is more like a working model than a finished work. However, given the circumstances of the bust's origins there is no reason to suppose that there ever was a studio model and the bust is probably a unique work.